"It is the customary fate of new truths," wrote TH Huxley, in one of my favourite quotes, "to begin as heresies, and end as superstitions." Fake news is nothing new, depending on what you mean by it. But during the past year - specifically during Donald Trump's election - it has become a cancer in the body politic, growing from an isolated but malignant tumour into a raging, mortal threat. No hack can witness this without alarm. As a BBC journalist I am required to be politically impartial; but as my distinguished colleague Nick Robinson has argued, I am under no obligation to be impartial about democracy (as against tyranny, for example). Nor am I under any obligation to be impartial about truth, as against lies. The possibility of truth is a necessary condition for democracy. Fake news is an assault on truth. Therefore it behoves all right-thinking journalists to combat fake news. First of all, what is fake news? Fake news is of three kinds. First, false information deliberately circulated by those who have scant regard for the truth but hope to advance particular (often extreme) political causes and make money out of online traffic. Second, false information that is circulated by journalists who do not realise it is false. All unintended errors of fact in the history of journalism, from hoaxes to exaggerated headlines - Freddie Starr never ate a hamster - fall into this category. That is why I say fake news is nothing new: in fact it is as old as journalism, if not older. The point about this kind of fake news is it often contains at least a scintilla of truth. Third, news that causes Donald Trump discomfort. 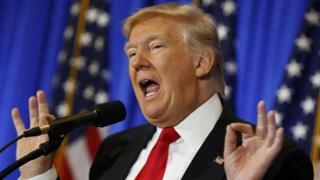 At his press conference last week, the president-elect targeted CNN, conflating that organisation with Buzzfeed. CNN says it had corroborated accusations about Mr Trump that it published; whereas Buzzfeed published a dossier that contained allegations that hadn't been corroborated. Mr Trump was discomfited by CNN; therefore he described it as fake news. The first kind of fake news - deliberate lies - has been energised by the viral power of social media. The Pope didn't back Mr Trump; nor did Denzel Washington. But millions may have believed one or both those propositions, and their originators got rich on the lie. The third kind of fake news isn't really fake at all. It's simply news that some people don't like to acknowledge, and wish to silence. But if you believe that the media should be free to scrutinise the use and abuse of power, and so hold power to account, the silencing of legitimate questions through the abusive epithet "fake news" is clearly anti-democratic. The first two kinds of fake news are, to varying degrees, hostile to the democratic process. A useful distinction would describe the second as false news rather than fake news. But with the third kind, it is the use of the term "fake news", rather than what it is describing, that is dangerous. The first kind spreads deceit and pollutes the well of civility on which strong societies must draw. The second - false news - damages trust in the media. In the third instance, use of the term "fake news" numbs scrutiny and also pollutes that well of civility. All proper journalists reside in the zone between truth and falsehood. Some try harder than others to resist the magnetic pull - and it can be very strong at times - of the latter. Most, if they have any self-worth, steer clear of the outright lies that make up that first kind of fake news. Many big media organisations recognise fake news is dangerous and are acting against it. Facebook, after initially expressing scepticism about the influence of fake news in the presidential election, has started taking it very seriously indeed. The BBC is boosting Reality Check, a fact-checking service that will work with Facebook. Several years ago Channel 4 News launched Fact Check, which fulfilled a similar role. These are all pleasing, practical measures. But there is a deeper philosophical issue at stake, concerning the role of truth in our society. No society can conduct the informed conversation necessary for civility, the resolution of disputes, or the judicious exercise of power and law if there is no agreement on basic facts. You cannot choose how to go forward if you cannot agree what just happened. Therefore it is necessary to agree that there are facts, or true propositions. In the West today, largely but not solely because of the advent of digital media, the truth is more vulnerable than it has been for a long time. This is partly because whereas falsity comes by degrees, truth is absolute; and therefore anything that chips away at its granite surface leaves a big dent. It is also because, as I wrote in the last editorial of the Independent newspaper (now solely online), the truth is hard, expensive and boring. Whereas lies are easy, cheap and thrilling. Finding out the real story takes time and effort. Time and effort cost money. Once you've found the real story, you have to verify it: that's what makes it true. But verification also takes time and effort. And sometimes, the thrilling tip-off you received turns out to be no more than that. It would be amazing if the Moon were made of cheese, or Elvis Presley still lived. But it isn't, and he doesn't. Fake news of the second kind - the sort of exaggerations and errors that are inevitable in journalism, and which I call false news - will always be with us. But fake news of the first kind has to be combated, and use of the term to silence scrutiny deserves the same harsh treatment. You cannot conduct either of these battles, however, unless you have the preliminary belief that truth is not only possible, but vital. And where might that come from? I'd suggest you start with the philosophers Bertrand Russell, AJ Ayer, and Simon Blackburn.